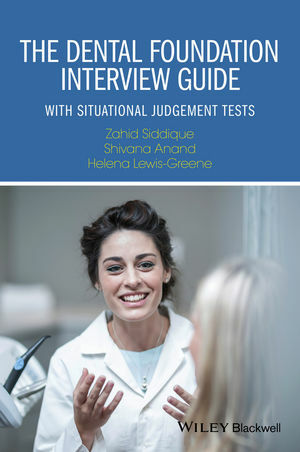 The Dental Foundation Interview Guide: with Situational Judgement Tests offers an indispensable step-by-step guide to the dental foundation training application process. Dr Zahid Siddique is co-founder of Dental Training Consultants, London, UK which runs The DF1 Mock Workshop for year five undergraduate BDS students. As well as currently working as a general dental practitioner, Zahid has a passion for teaching and has delivered lectures entitled Antibiotic Resistance - The Time Bomb and Prescribing in Dentistry. To facilitate his passion for teaching, Zahid was awarded an honorary tutor role at King’s College London Dental Institute and Guy’s Hospital, London, UK and is an examiner for The Royal College of Surgeons of England Overseas Registration Examination. Dr Shivana Anand is co-founder of Dental Training Consultants, London, UK. Shivana received the Dentistry FMC Fast Track 4 accreditation for innovative new dentists in 2014 and the ‘Dental Prodigy’ award at the BDIA Dental Showcase 2015. She was also shortlisted for the ‘Best Young Dentist’ award at the BDIA Dental Showcase 2015. To facilitate her passion for teaching Shivana was awarded an honorary tutor role at King’s College London Dental Institute and Guy’s Hospital, London, UK. Dr Helena Lewis-Greene is Senior Clinical Teacher, Director for Student Welfare and Coordinator for Year Five BDS students at Guy’s Hospital, London, UK. Helena was the joint recipient of the Teaching Excellence Award for the King's College London Dental Institute for 2011/12.